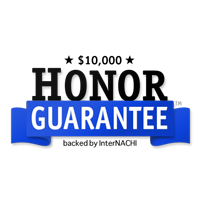 Unlike most home inspection companies in the Houston area, at HTown Home Inspections, Certified Thermographer Mark Roach includes thermal imaging for free with every complete home inspection. 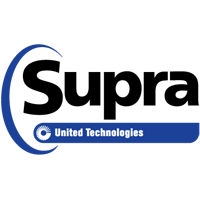 Infrared thermal imaging involves using specially-designed equipment to create pictures of the infrared energy emanating from an object. 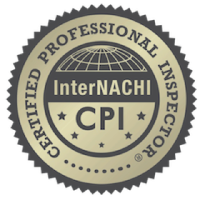 This allows your home inspector to locate areas of heat discrepancies, which your inspector will then interpret, taking your home inspection that much further. 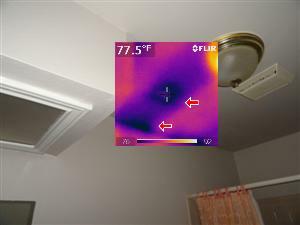 While thermal imaging does not let you “see through walls,” it is an extraordinarily helpful tool that can enable your home inspector to find issues that might not be able to be detected using the unaided human eye alone. Thermal imaging is particularly useful when it comes to finding hidden water intrusion, electrical hotspots, disconnected air ducts, and missing or insufficient insulation within the walls or ceilings. This is what a normal home inspector sees. This is what we see on our home inspections. The dark blue areas are the hidden moisture. We back up our findings with a non-invasive moisture meter. This picture shows hidden water intrusion (dark area). There were no visible sign of water damage on the wall. 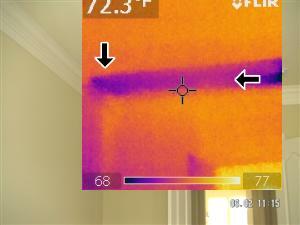 We would never have seen this without a thermal imaging camera, which we use on every inspection. 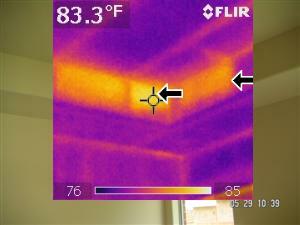 This picture shows missing insulation. This was not visible without the use of a thermal imaging infrared scan. Most water intrusion is not visible to the human eye. With a thermal imaging camera we pick it up very easily. This would never have been discovered without the thermal imaging camera. We found this hidden water leak in a ceiling under a bathtub. There were not signs of water damage on the ceiling. 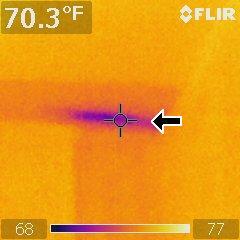 Without the thermal imaging camera we would not have been able to find this problem. The home buyer, however, would have eventually found this after they’d moved in. 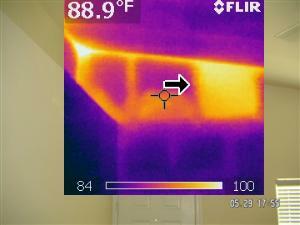 Make sure your inspector uses a thermal imaging camera to find problems like this. 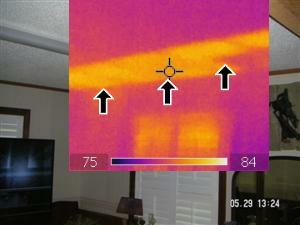 Missing insulation found on a home inspection in Tomball, TX. 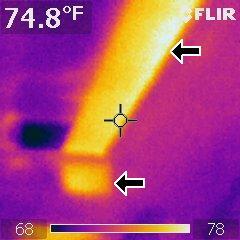 This is an image of an air duct that was leaking in the ceiling cavity on a 2 story home. This could lead to moisture damage due to condensation. 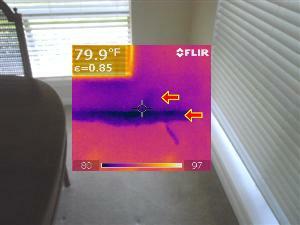 These areas would likely not have been seen during a home inspection that did not include thermal imaging. Cypress, Tx. 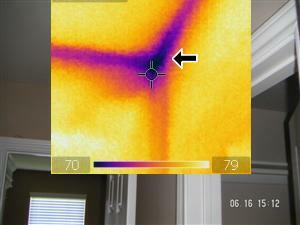 Thermal imaging scan finds a hidden water leak in a ceiling. 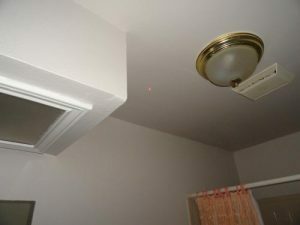 There were not any water stains present on the ceiling when we performed the home inspection. 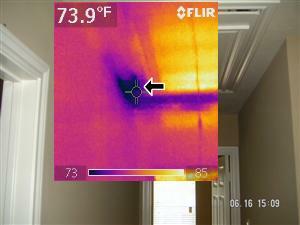 This problem would not have been detected without a thermal imaging infrared scan. Houston, TX. How efficient is your home? 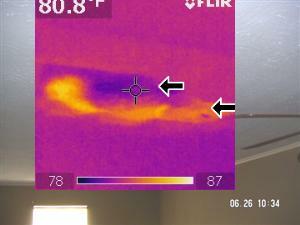 Houston home inspector finds missing insulation inside of a wall using their infrared thermal imaging inspection camera. 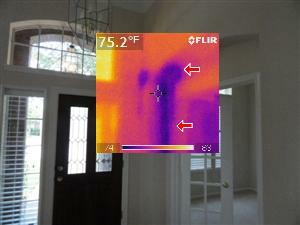 Missing insulation found using a thermal imaging infrared camera on a home inspection in the Woodlands, TX.